The Papillon is a small, friendly, elegant toy dog with a fine boned structure. He is light and dainty, yet still lively, and is distinguished from other breeds by his beautiful, butterfly-like ears. They are known to be happy and alert little dogs that are not shy or aggressive. The breed must be either parti-color or white with patches of any color. 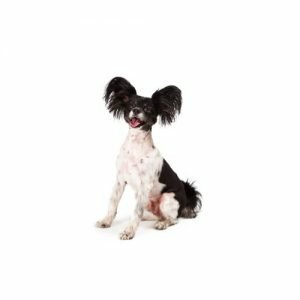 Papillons, which used to only have large, drooping ears, were known in the 16th and 17th centuries as Dwarf Spaniels and were often depicted on the laps of French and Spanish noblewomen. Over time, an erect-eared type, fringed as to resemble the ears of a butterfly, developed (Papillon means “butterfly” in French). In the United States, Papillons (erect-eared) and Phalenes (drop-eared) can be born in the same litter and are shown together as one breed. Papillons are a happy breed whether living in an apartment, out in the country or anywhere in between. They love to play outdoors, but they can be easily entertained and exercised indoors as well. Because they dont have an undercoat, they dont require a lot of grooming but should still be brushed regularly. Toy Group; AKC recognized in 1915. Ranging in size from 8 to 11 inches tall at the shoulder. Are you interested in purchasing a Papillon? By clicking “yes,” I authorize Petland Knoxville and Third Party Pet to deliver or cause to be delivered telemarketing text messages using an automatic telephone dialing system. I acknowledge I am not required to sign the agreement (directly or indirectly), or agree to enter into such an agreement as a condition of purchasing any property, goods, or services. I may opt out of text messages at any time by texting "STOP". Standard message rates apply. Petland Knoxville https://petlandknoxville.com Petland Pets Makes Life Better! 5.0 23 based on 23 ratings.